The RI school mace carried by the Standard-Bearers at Founder’s Day, commissioned in 2009. Despite the archaic façade projected by the ceremony, many of these traditions are actually fairly recent inventions. Academic processions were first introduced in 1991 by Headmaster Eugene Wijeysingha after RI became an independent school. Similarly, the school mace was actually commissioned in May 2009 and debuted just 3 years ago, after being mooted by Professor Tan Ser Kiat, Chairman of the Board of Governors. In fact, there is no fixed date for Founder’s Day – following the re-integration of RI and RJC, it was shifted from May to July. And while RI counts 1823 as its year of founding, classes did not begin until 1834 and the school did not have a campus until 1837. Does this then make Founder’s Day a pointless spectacle? This newspaper is less cynical. No doubt, Sir Stamford Raffles might never have imagined that his statue would one day grace such grandiose festivities when he laid the humble foundation stone of the Singapore Institution. And after the endless speeches and sumptuous reception, it will be back to business as usual on Monday. But it is precisely the fact that Founder’s Day holds no tangible or practical value which makes it special. In a hyper-competitive environment where nearly everything comes down to crunching numbers, it is worth standing at attention and mouthing the words of “Rafflesians Salute Your Alma Mater”, if just to soak in the atmosphere of solidarity and help ourselves conceive of some of the inexplicable things in life: mystery, destiny, higher authority, and a sense of belonging to a community. Perhaps Founder’s Day pins down one of the biggest tensions in this school, characterised by the double-headed eagle in our crest: even as we look to the past for inspiration, we relentlessly, almost inexorably, look towards the future – the “Better Age” which we are promised. For right after the customary rites were dispensed with, Principal Mrs Lim Lai Cheng took to the stage and delivered the Institution Report, announcing a series of eye-popping facts centred around the FIRE values as her guests – donors, alumni, parents, partners alike – stayed glued to the glitzy, full-colour 100-odd page booklet they were presented with. It was a sleek performance befitting any CEO at the Annual General Meeting (AGM) of a major corporation. As we celebrates the triumphs of the day and take on the hurdles of tomorrow, reconciling it with the weight of the past could well prove to be the balancing act which each of us – and the school at large – needs to undertake. If we get it right, then it’s up, up and away! 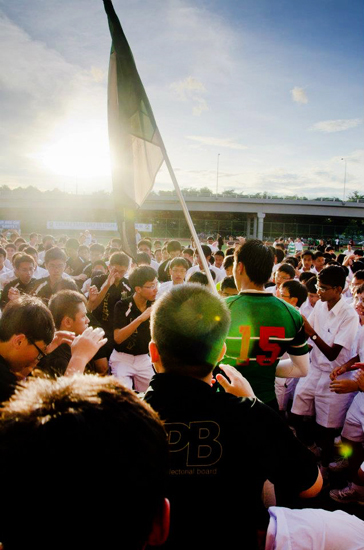 Despite losing the match, the school gathers together for the Unite Cheer at the end of this year’s Kiwi Cup.